“Hey, it’s West, By God, Virginia” was a phrase more frequently heard from Rick Cook, whether he was recalling his “earlier days” as an ambulance chasing hearse driver, working in the Governor’s Mansion, or writing papers for the U.S. Department of State to provide an intellectual base for world wide heritage conservation decisions in a United Nations forum. He had not shaken off his own “West by God “ Virginia heritage when he was a park guide giving interpretative presentations at the Lincoln Memorial on the National Mall in Washington, and then accepted a position in the National Park Service (NPS) international affairs branch. Rick helped provide the philosophical basis for NPS contributions in the conservation of both natural and cultural heritage around the world. He helped create opportunities for NPS personnel to grow in their understanding, knowledge, and professionalism in their work. He provided opportunities for them to communicate and work with their peers outside the U.S.
His remarkable international achievements included years of drafting of conservation position papers for Interior and State departments delegations participating in the implementation of the World Heritage Convention. His colleague Ray Wanner in the State department readily admitted Rick was the best in writing these substantive and sensitive policy documents, in part because he knew and understood this most widely accepted international environmental treaty, The World Heritage Convention. He was probably second only to Russ Train, the architect of the Convention, in his understanding of the language, spirit and intent of this quantum leap of the national park “idea” and a global acceptance of the fact that the importance of heritage extends beyond national boundaries. We recall him welcoming a dawn perched on a Paris roof top with a select few including a Deputy assistant secretary of the interior and the director general of Parks Canada (wearing an old leather flying helmet) – perhaps they were all flying at the time. While Rick designed and had adopted World Heritage Site signs used around the world, he also almost burned down UNESCO’s Washington headquarters by leaving his still burning pipe in his raincoat pocket hanging on the rack. Rick was selected to serve as staff assistant to the office of the assistant secretary, Fish and Wildlife Service, and assumed responsibilities leading to the election of the U.S. as chair of the 21 nation World Heritage Committee. With a change of administration, he returned to international affairs. There Rick single handily wrote the rules for governing the implementation the legislation allowing the U.S. to participate in the World Heritage Convention. Rick also made many friends and allies for our country through his personal diplomacy and well-reasoned thought process. He often offered a quiet, reserved helping hand, such as making the necessary arrangements for the wife of a wildlife manager from India to sell her jewelry so her husband could complete his graduate studies here in the U.S. That individual now directs World Heritage in UNESCO, Paris. With close collaboration with friends and colleagues on both sides of the Canadian border, he was intimately involved in negotiations over sensitive and essential international boundary issues directly affecting our border parks and beyond. He also led the way in strengthening relations and collaboration with the Bahamas National Trust and Mexico. He played a key role in NPS collaboration with the Peoples Republic of China and in several U.S. – USSR summit meetings concerning the creation of an International Heritage Park – Beringia – between Alaska and Siberia. 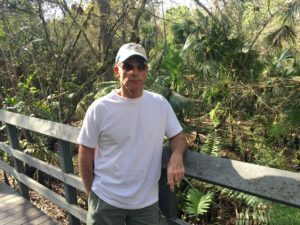 In 1994, Rick transferred to Everglades National Park as the public information officer and served there until his retirement in 2005. As the park’s chief spokesman he had to address many difficult issues related to restoring the historic water system. He worked tirelessly on general management plans for both Everglades and Dry Tortugas national parks. The latter proposed a new approach in understanding and managing marine resources by establishing a marine research natural area. His wry sense of humor and prior knowledge of Washington prepared him well for his work representing the park. Those who knew him always enjoyed spending time with this kind, sophisticated, and capable man. Rick passed away in September 2016. He was a valued friend who contributed significantly to the National Park System and will be sorely missed.